In this story, the second book in the Mary Jane series, five-year-old Mary Jane has more happy wholesome adventures, this time at her great-grandparents' farm in the country where she hunts for eggs, picks berries, finds baby rabbits, goes to the circus and more! Clara Ingram Judson (1879-1960), was a popular American childrens' author who wrote over seventy books. The first book in the Mary Jane series! 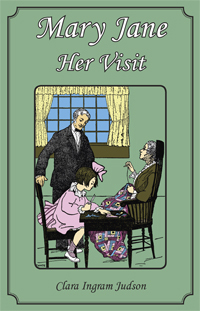 "...a delightful tale about a young girl that goes to visit her grandparents on their farm. She has some wonderful adventures and enjoys helping out with the farm chores... This is definitely a must read for little girls..." ~ Christina A. "My daughter, who is 6, and I enjoyed reading about Mary Jane every evening before bed. I received this as an e-book, and would just cuddle up on the bed with the laptop on my lap, and read until my daughter fell asleep. It is such a precious story, so innocent and full of life." ~ Jenni R.